"A.G. Brown, printer, Malden, Mass." -- Verso of card. 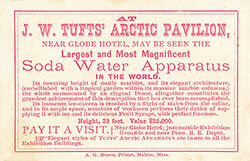 "At J. W. Tufts' arctic pavilion, near Globe Hotel, may be seen the largest and most magnificent soda water apparatus in the world. Its towering height of costly marbles, and its elegant architecture, (embellished with a tropical garden within its massive marble columns,) the whole surmounted by an elegant dome, altogether constitutes the grandest achievement of this description that has ever been accomplished. Its immense ice-cavern is reached by a flight of stairs from the cellar, and in its ample space, numbers of workmen perform their duties of supplying it with ice and its delicious fruit syrups, with perfect freedom. Height, 33 feet. Value $25,000. Pay it a visit. Near Globe Hotel; just outside exhibition grounds and near Penn, R.R. depot. 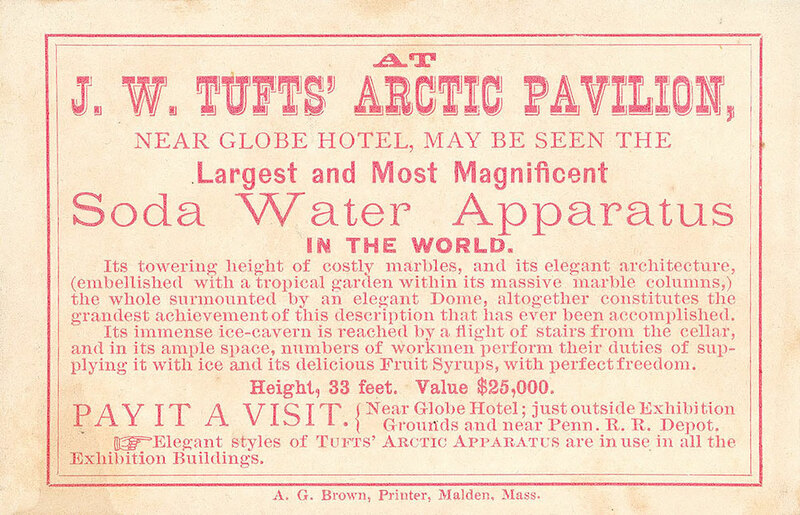 Elegant styles of Tufts' Arctic Apparatus are in use in all the exhibition buildings. " -- Verso of card. 1 trade card : 7 x 12 cm. 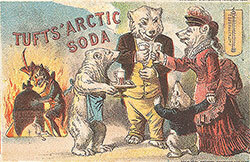 Trade card for Tufts' Arctic soda at J.W. Tufts' Arctic Pavilion. Recto: four polar bears, dressed in human attire, drinking soda water. A demonic character lowers a keg with a small animal into the fires of hell and a thermometer are in the background. Chromolithograph. Verso: text. Red ink on white card.